Connecticut U.S. Sen. Chris Murphy, second from left, with Democratic Sens. 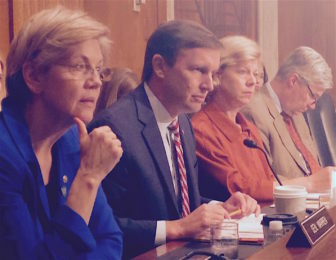 Elizabeth Warren of Massachusetts, Tammy Baldwin of Wisconsin and Sheldon Whitehouse of Rhode Island at a hearing Thursday on reform of federal mental health policy. Washington – A Senate panel took up the issue of mental health care Thursday, discussing legislation promoted by Sen. Chris Murphy to overhaul the system, an unusual move since Congress hasn’t tackled comprehensive reform in decades. While a number of senators from both sides of the aisle said they wanted changes to the federal government’s role in mental health care, there won’t be action for a while. “I guess the short answer is ‘next year,’ said Sen. Lamar Alexander, R-Tenn., chairman of the Senate Health Education, Labor and Pensions Committee that held Thursday’s hearing. Alexander said he hoped to schedule another hearing on the issue before the end of the year and move a final bill out of his committee in 2016. Murphy said he didn’t expect Congress to move any more quickly, considering the complexities of mental health problems and the number of federal agencies involved in the issue. The hearing comes after a spike in mass shootings by gunmen who were considered to have mental health problems, including Adam Lanza, who killed 20 children and six adults in Newtown, and the shooter who killed nine in a community college in Oregon. Sen. Sue Collins, R-N.H., told a gripping tale of a young man with schizophrenia who did not receive the care he needed until he “butchered” his mother. Thomas Insel, director of the National Institute of Mental Health, said two-thirds of mentally ill people are smokers and that, not suicide, is why mentally ill people have a lifespan that is, on average, 10 years less than others. Still, Insel said, suicides continue to be a problem. “Homicides have gone down 50 percent and we are looking at the same suicide rate as we had in the 1990s,” he said. “You need to really ask in a bipartisan way, is this the country you want to be? Is this how you want to treat people with a brain disorder?” Insel asked. Just 6 percent of federal health spending goes toward mental health services, and 1 percent toward combating substance abuse, said Kana Enomoto, the head of the Substance Abuse and Mental Health Services Administration. Lawmakers discussed several pending bills that would overhaul the federal mental health system, including the legislation introduced by Murphy with Sen. Bill Cassidy, R-La., in August. The bill would establish a new office at the Department of Health and Human Services devoted totally to oversight of the federal government’s role in mental health care, headed by an assistant secretary of mental health and substance abuse disorders. The Mental Health Reform Act of 2015 would also require the federal government to audit compliance with the Affordable Care Act’s requirement that there be parity between insurance benefits for physical and mental illnesses. The legislation also would repeal the current Medicaid exclusion for inpatient mental health care for individuals between 22 and 64 years old and clarify medical privacy laws to make clear that health professionals can share information with family members of the mentally ill.
And the bill would implement a new grant program that would focus on early intervention and mental health treatment for children and young adults. Murphy’s bill has bipartisan support and a companion in the U.S. House of Representatives. But his legislation is one among several on the topic introduced in this Congress, including a bill sponsored by Alexander. Murphy said he did not have “pride of ownership” of the issue and would be happy to back a compromise bill. “I want to get something that significantly moves the ball forward,” he said. Murphy also said he was confident Congress will act to reform the system.